I was reading this month's Pass the Book last weekend as I was participating in Shimelle's Online Scrapbooking Weekend, and it inspired me to pull out some of my stamps and use them. I used some alphabet stamps for my Donation layout and another alphabet set plus a background stamp for Nichole's Adventure. I always enjoy using my stamps but had gotten in the habit of using them mostly on cards. Creative Stamping for Scrapbookers is filled with ideas for using stamps on layouts as well as step-by-step directions for stamping techniques and would be great for anyone looking for inspiration to utilize the stamps collecting dust in her scrap room and for those wanting to learn a few new ways to use her stamps on layouts. If you'd like to be in the draw to be the first recipient of this month's book, please leave a comment telling me the last layout you created using at least one stamp. I'll draw a winner on Sunday and get this book on its way. If you're new to Pass the Book:Year Two, click here to check out all the details. If you already know how things work, you also might want to click here and scroll down to the bottom of the page to see which other books are ready to be passed on right now! 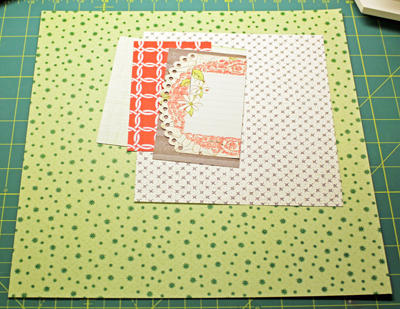 I decided to copy the size of Jen Gallacher's sample layout for Shimelle's fourteenth challenge, so this page is 8 1/2 x 11. 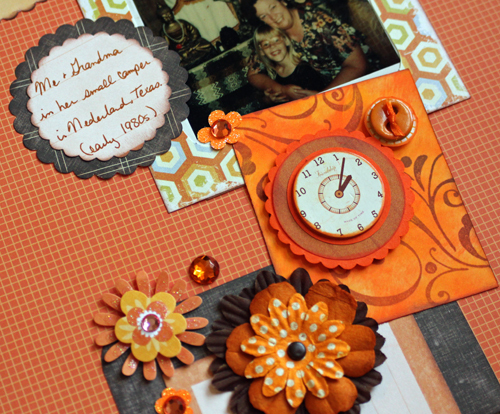 The challenge was to create a scrapbook page with four unique sections. There was a video included in Shimelle's post that showed how Jen put each section together separately, and I enjoyed following that process for this layout. I used a zigzag stamp and alphabet stamps on the bottom left section - both inspired by the book I'll be passing in the next few days. I started with some hazy greenish photos of me reading to my great-nephew when he was here back in 2009 for Shimelle's Fifteenth Challenge to treat a rubbish photo (or several) like they were every other picture in your world. 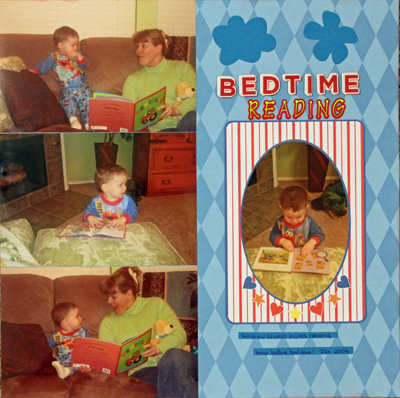 There's a lot of green in these photos, but I wanted the focus to be on Andrew in his blue pjs, so I used blue paper & embellishments. I actually think this technique really improved the quality of the photos. I had to laugh when I saw Shimelle's sixteenth challenge to use your leftovers from this weekend. I think her theory is that we've scrapped for a couple of days and have scraps covering our craft table that can be used on this last layout. I, however, clean off my craft table after every layout/card/project - it's just what works for me. So, I pulled scraps from my scrap files for this layout, some are papers that I've used on this past week, others are scraps from previous projects. I copied the design of Amy Tan's layout that Shimelle provided in this prompt. I logged in to Blogger this morning to discover that "Blogger has a new look!" And just when I've gotten so comfortable and much quicker at creating posts. Luckily, the changes aren't too different, but I will have to get used to the new look and be careful not to click the wrong buttons. A huge thanks to everyone who commented on my 500th blog post. I've chosen two winners for my scrapbooking supplies giveaway. I'm so glad I came upon your blog through Shimelle, I think less than a year ago but time goes so quickly! I look forward to seeing more of your layouts and organisation skills, you put me to shame!! Once again I've combined inspiration - this time Shimelle's thirteenth challenge (to create a project with a free printable from Little Musings) with sketch #6 from the 28 Sketches workshop. 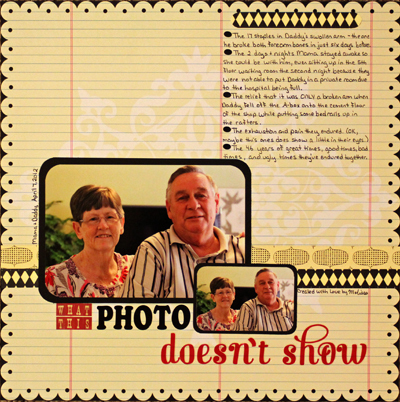 I had previously blogged this story, so it was easy to make a few adjustments to the journaling and print it out on one of the journal blocks provided. Two of the photos are also matted on blocks from the printable. I combined Shimelle's eleventh challenge to mix two contrasting patterns to create a background with the LOM Community weekly challenge to create a Storage Binder layout with one focal photo & the remaining photos cropped & lined up side by side. For my background, I chose a newer floral paper and an older striped paper from my stash. 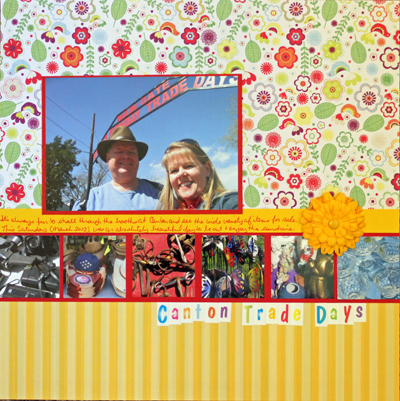 Journaling reads: It's always fun to stroll through the booths at Canton and see the wide variety of items for sale. This Saturday (March 2012) was an absolutely beautiful day to be out & enjoy the sunshine. 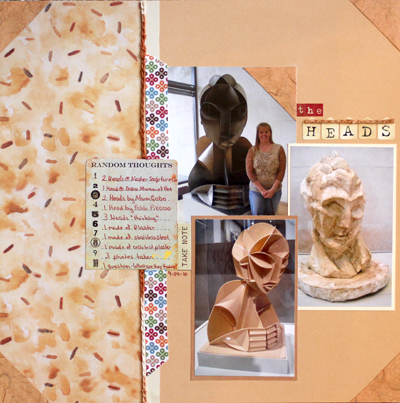 I started with sketch 13 in the 28 Sketches Workshop to complete Shimelle's Twelfth Challenge - create a page with one photo printed twice. I believe this is the first time I've ever used the exact photo twice on the same layout, but I absolutely love the way this turned out. *The 17 staples in Daddy's swollen arm - the one he broke both forearm bones in just six days before. *The 2 days & nights Mama stayed awake so she could be with him, even sitting up in the 5th floor waiting room the second night because they were not able to put Daddy in a private room due to the hospital being full. *The relief that it was ONLY a broken arm when Daddy fell off the A-box onto the cement floor of the shop while putting some bed rails up in the rafters. *The 46 years of great times, good times, bad times, and ugly times they've endured together. BTW - there's still a little time to get in the draw for my 500th Post Giveaway! Click here for the details. 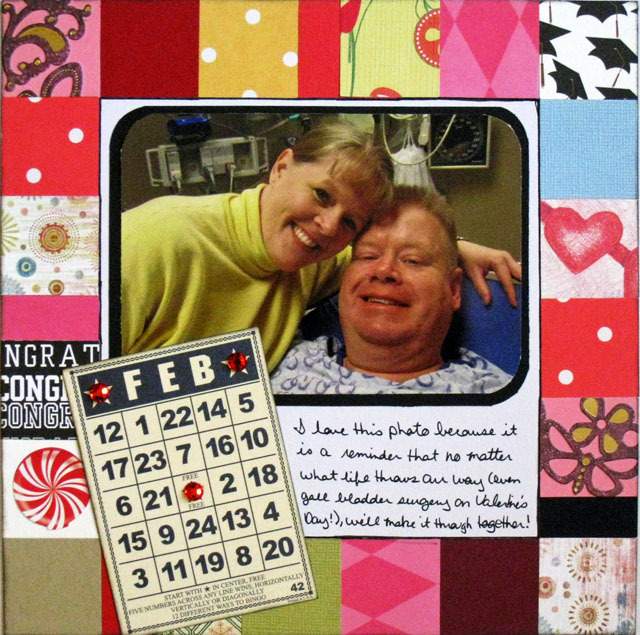 Journaling reads: I love this photo because it is a reminder that no matter what life throws our way (even gall bladder surgery on Valentine's Day! ), we'll make it through together! 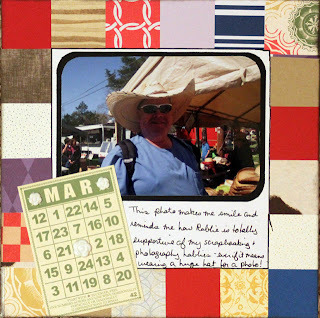 Journaling reads: This photo makes me smile and reminds me how Robbie is totally supportive of my scrapbooking & photography hobbies - even if it means wearing a huge hat for a photo! 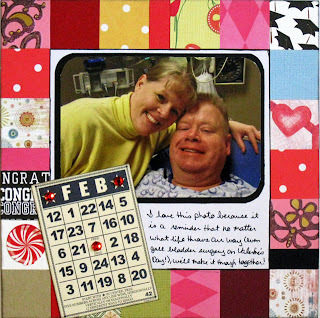 These 8x8 layouts are for my 2012 Photos I Love album. 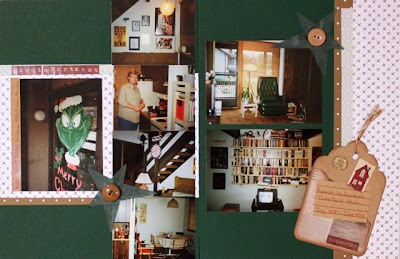 I knew exactly what background paper I wanted to use when I read that Shimelle's Tenth Challenge was to scrapbook two photos on a bold background. What could be bolder than a foam glitter sheet? However, as I worked with the layout, I ended up with only one photo. In place of the second photo, I added four trading cards that went along with the theme of my layout. 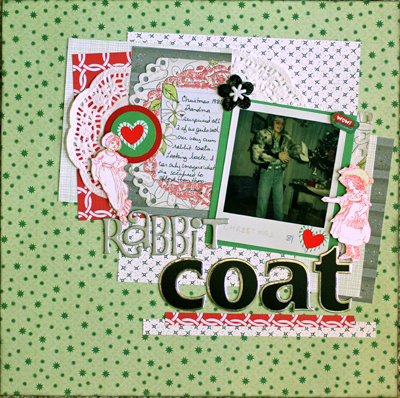 Journaling reads: Watching the popular DALLAS TV series in the 1980s, Robbie never imagined that he'd one day move from Ohio to Texas. When he started his new job in 2011, I asked him on his first day how he liked his new office. 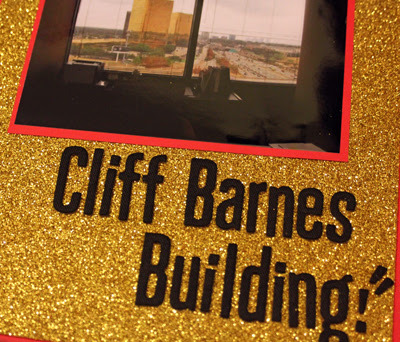 His reply, "It has an excellent view of the Cliff Barnes Building!" I was disappointed that I didn't have a trading card with Cliff's photo, but I absolutely love having these vintage items on my layout. 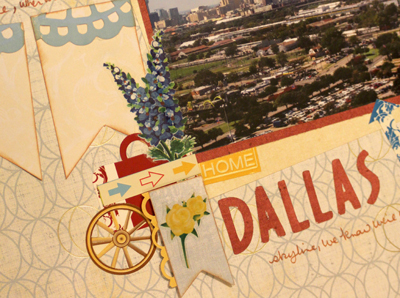 We're looking forward to seeing if the new Dallas TV series (premiering in June) will become as iconic as the original. 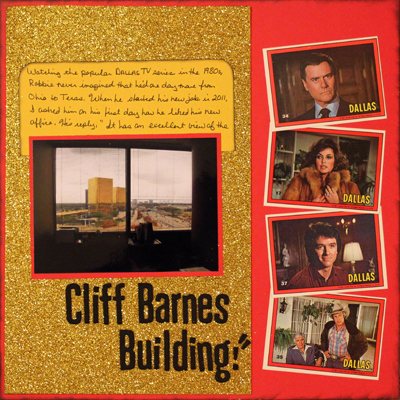 Anyone else have memories of watching the Ewings and the Barnes scheme to outdo each other? Do you know who shot JR? 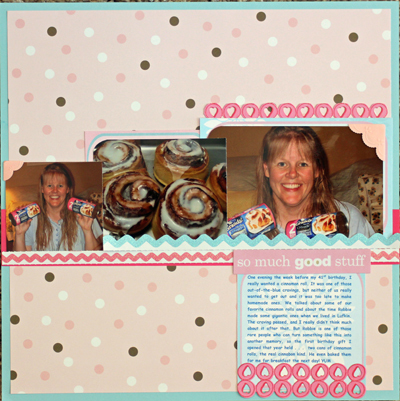 My challenge to myself this weekend was to fully participate in Shimelle's Scrapbooking Weekend and complete all the challenges. I was feeling pretty good when I went to bed last night and had completed all six challenges and commented on the other questions posts. However, when I woke up this morning, I discovered that FOUR new challenges had already been posted. By the time I returned from church and was ready to start scrapping, another challenge had been posted and I read Shimelle's comment that she had TEN challenges for today. So, my revised goal is to complete as many challenges as I can today and then pick up the leftovers as I have time throughout the week. I have completed three more challenges at this point and am sharing them below. For two of these challenges, I used sketches from the 28 Sketches workshop as I continue to also work my way through those. OK, I still have a few hours left in the day, so I'm going to attempt a couple more layouts. ﻿How about you? Are you still scrapping this weekend? 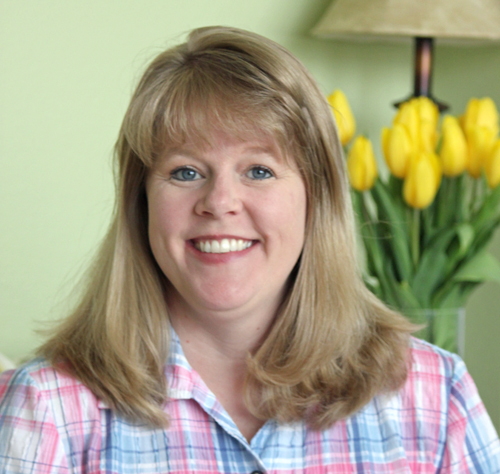 I can hardly believe that this is my 500th post since I started this blog over two years ago! I'm sharing Shimelle's sixth challenge, but keep reading and scrolling down because there's also details about my 500th Post Giveaway. 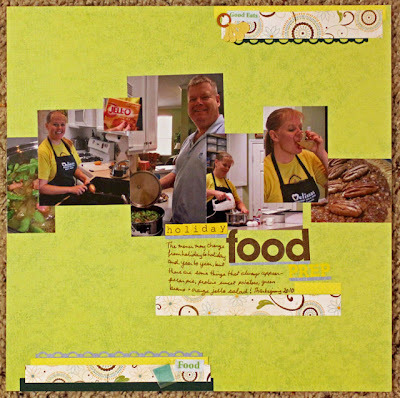 The challenge for this layout is to scraplift a layout with a twist. 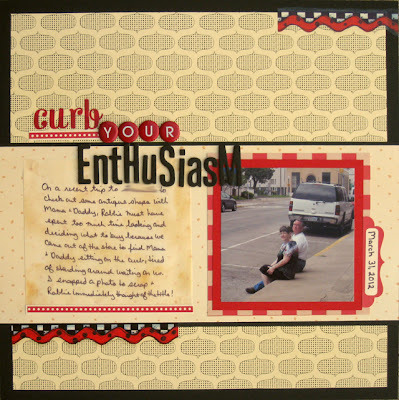 Special crop guest Relly Annett-Baker shared how she took one of Shimelle's girly layouts and changed it to create a boy-themed layout. I decided to use the same layout design that both of them used, except that mine does not have a kid theme at all. 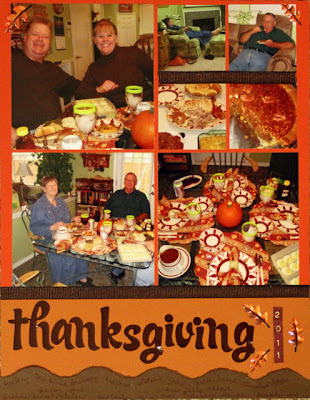 I also left out the embellishment clusters in my layout because once I had the photos & journaling, I really felt that the layout was complete. 10. 1 question - What are they thinking? Now on to my 500th Post Giveaway. Leave a comment below telling me how long you have been reading my blog and what you most enjoy about it to be in the draw for a miscellaneous selection of scrapbooking supplies! As I've been in such a scrapping frenzy these past few days, I've been organizing my supplies along the way and am feeling truly blessed to have such an ABUNDANCE . . . and I want to share with you! So be sure to leave a comment by noon (CST) on Wednesday, April 18, when I'll draw a random winner (or two). 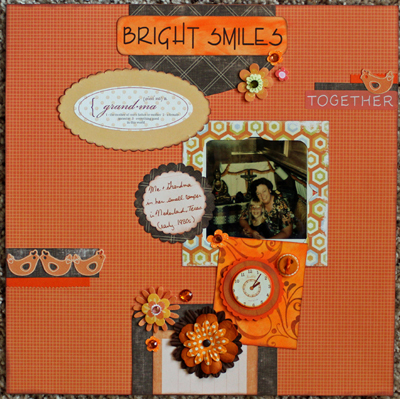 Shimelle's third challenge involves scraplifting - oh yeah, this is something I can definitely do! Ok, actually the challenge reads - mix your style with a look you haven't tried. I decided to try to emulate one of Sian's layouts because they seem so different from mine. 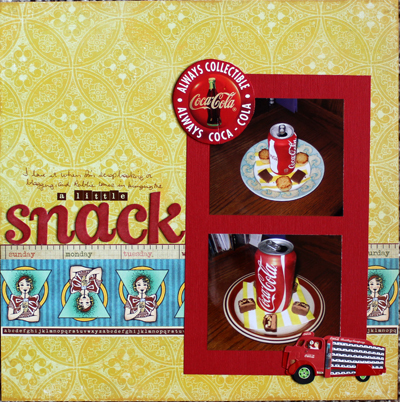 She often uses a neutral background, a small photo, banners, and lots of small (often handcut) embellishments in little clusters. She also often uses photos of things or places where I normally use photos of people. 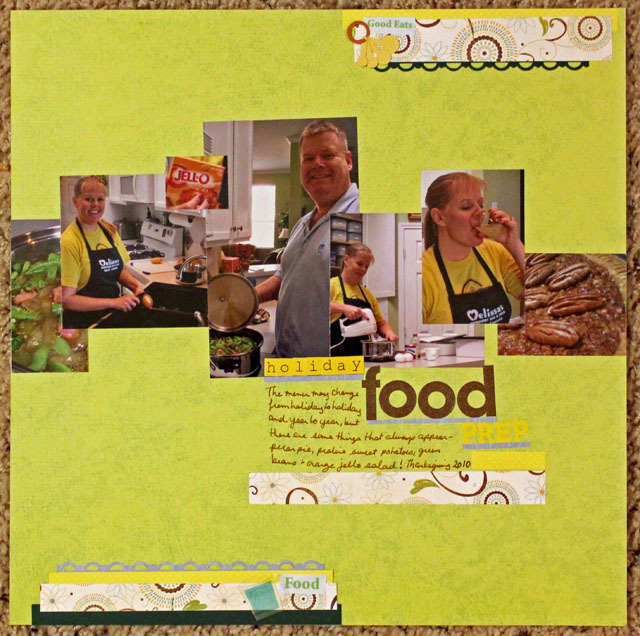 I chose this layout to lift for Shimelle's challenge. I maintained the 4x6 size of my photo, but otherwise followed her layout fairly closely. I actually handcut my banner pieces and enjoyed adding all the little bits & pieces to the embellishment cluster. Journaling reads: No matter where we've been or how long we've been gone, when we see the . . . DALLAS skyline, we know we're almost home. It's just now noon here in Texas and I've completed my second layout of the day! Shimelle's second challenge was a little more difficult, yet also easy. 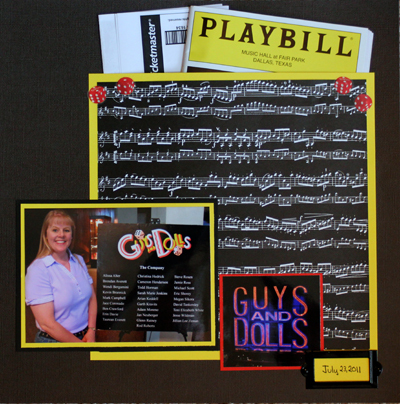 The challenge is to create a page using three or more paper collections. The difficult part is that I rarely never pay attention to the manufacturer or collection when I'm buying or using products. I just buy what I like and use what works with my photos and stories. 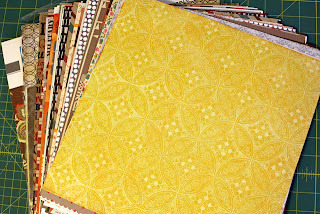 Luckily, I had this huge pile of new papers that I've picked up over the past few weeks sitting next to my craft table & I was able to pull papers that had that nice little tab telling me the manufacturer & collection. 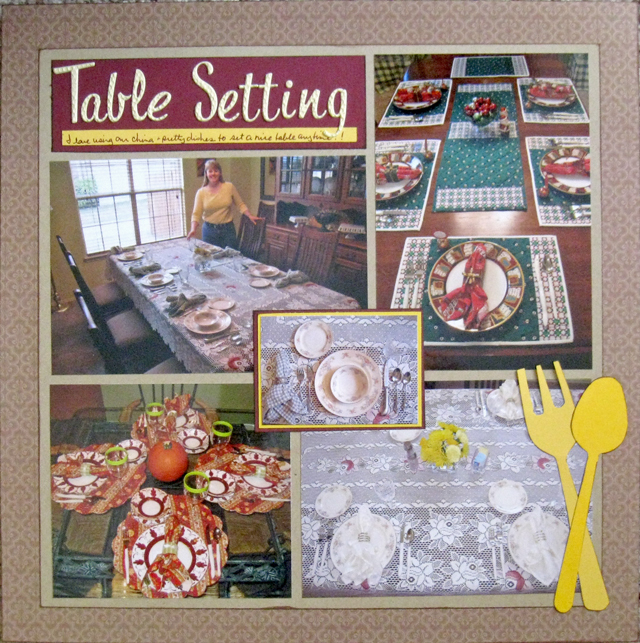 I decided to use sketch 5 from the 28 Sketches workshop for this layout, thus combining some inspiration this weekend! 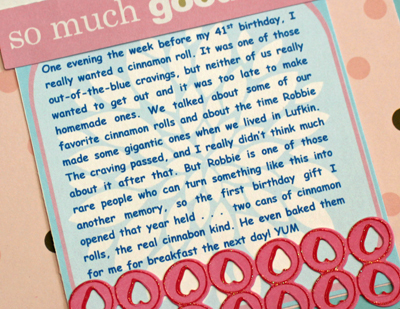 Journaling reads: I love it when I'm scrapbooking or blogging and Robbie comes in bringing me a little snack. So, you see, the easy part was combining different collections - because that's what I always do! And lest you think I skipped sketch 4 in the 28 Sketches workshop, here's the two-page 8 1/2x 11 layout I created before heading to bed late last night. These late 1980s photos are of Robbie's first apartment. Notice the Grinch he painted on his window that Christmas - pretty good artist, isn't he? 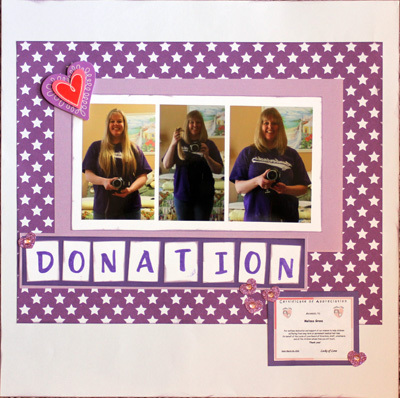 Shimelle's Scrapbooking Weekend is underway, and I was immediately inspired this morning by the first challenge to take inspiration from a scrapbook page by Jaime Warren. 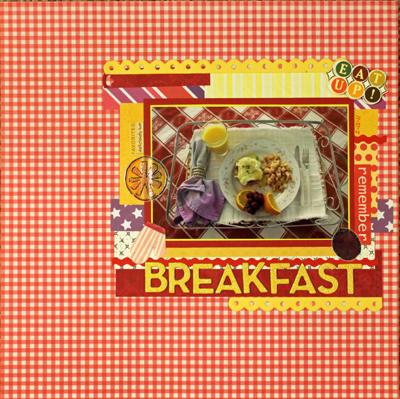 I loved the bright background and scattered embellishments. I spent yesterday sorting through and organizing some of Grandma's old photos (more on that project in the next few weeks), so I've naturally been thinking about and missing my Grandma. I thumbed through my childhood photos storage binder and pulled an old Polaroid photo of the two of us for this layout. 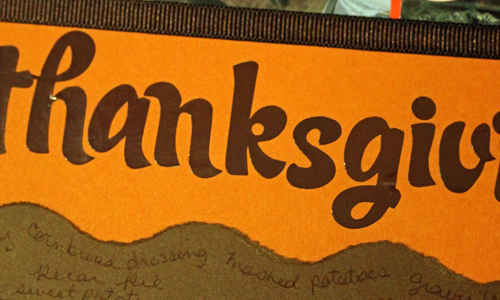 I grabbed a bright piece of patterned paper and lots of embellishments, then set to work. It was fun to use a bunch of miscellaneous bits & pieces on this layout. I'm hoping to participate throughout the weekend in Shimelle's Scrapbooking Weekend, so you may be seeing several posts. Are you joining in the fun? I want to end by answering a couple of questions from the comments on my 28 Sketches - the first three post from yesterday. *Orange Jello Salad is a dessert dish - the recipe is here. *I am finding the sketches in 28 Sketches inspiring, however they are very simple compared to many that I've worked with. What I'm enjoying most is the feeling that my scrapping skills have improved and I can add to and modify the sketch to work with my photos and story. *I am still undecided about taking Ali's 31 Days workshop, mainly because I have a terribly busy schedule during those weeks. Of course, I still have a few weeks before I have to make my mind up, so you just might "see" me there. The last day before registration closed, I decided to sign up for the BPC 28 Sketches Workshop by Lisa Day. Each day a new sketch is delivered to my inbox; some of the sketches are for 12x12 layouts while others are for 8 1/2x11, some single page and some double page. There are 15 sketches so far, however I'm quite a bit behind on creating layouts, so I only have three to share today. It's a little hard to see in the photo, but I wrote our menu for the day on that wavy brown cardstock at the bottom. Journaling reads: On a recent visit to check out some antique shops with Mama & Daddy, Robbie must have spent too much time looking and deciding what to buy because we came out of the store to find Mama & Daddy sitting on the curb, tired of standing around waiting for us. I snapped a photo to scrap & Robbie immediately thought of the title! I really like the simplicity of these sketches and am looking forward to using the other 25 sketches over the next several weeks. Anyone else taking this class? 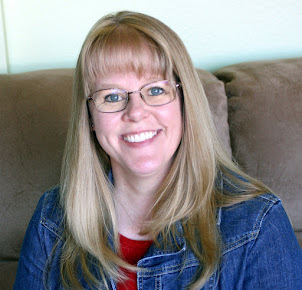 One of the things I enjoy most about the online scrapbooking community is the amount and variety of quality FREE STUFF, and today as part of Shimelle's Ten Things blog hop I'm sharing ten "free" links. 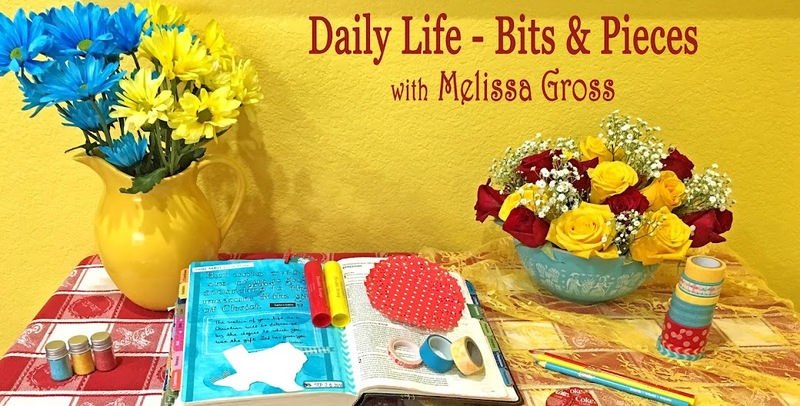 Some of these links are for upcoming events while others are free classes and products you can access now, some are brand new while others have been around a while, some are from industry gurus while others are from everyday scrapbookers/ bloggers willing to share. I hope you find one or two that will inspire your creativity this week. 2. 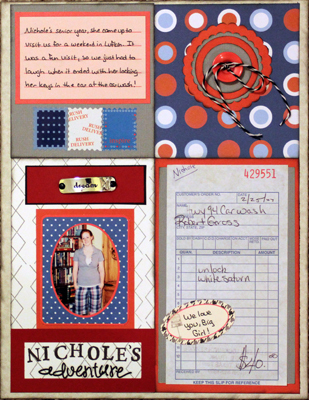 Shimelle is hosting an online scrapbooking weekend coming up this weekend, April 13-15. Click the chalkboard below for all the details and get ready for a weekend full of challenges, tutorials, and inspiration. 3. 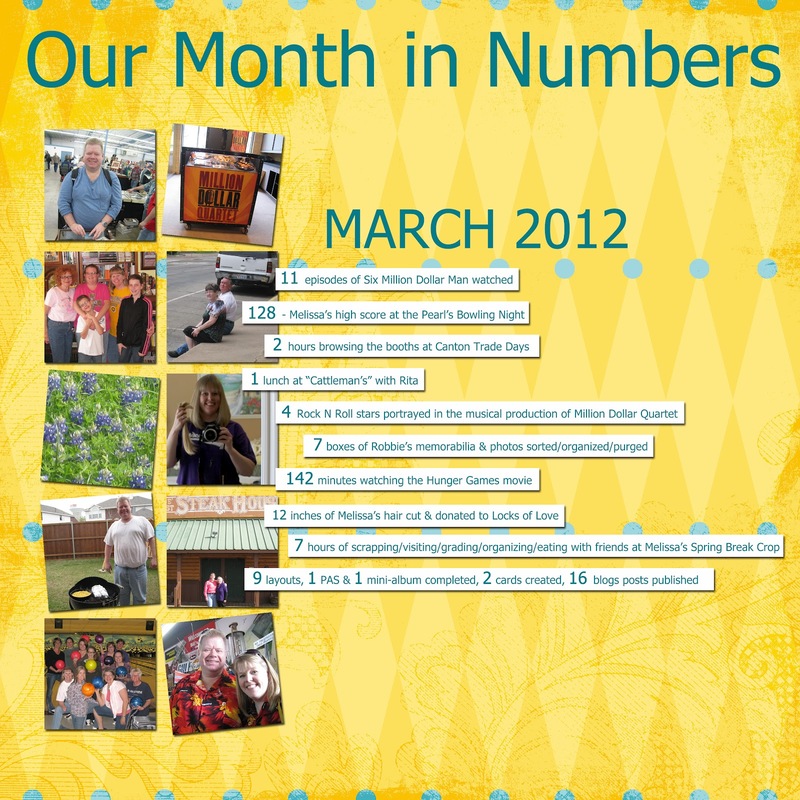 The Paperclipping Roundtable is a weekly discussion on a variety of memory keeping topics. Click here to listen directly on your computer or for a link to subscribe in iTunes. 4. Ali Edwards' 52 Creative Lifts is a "reflection/investigation on some aspect of creativity" in the form of a free weekly newsletter. 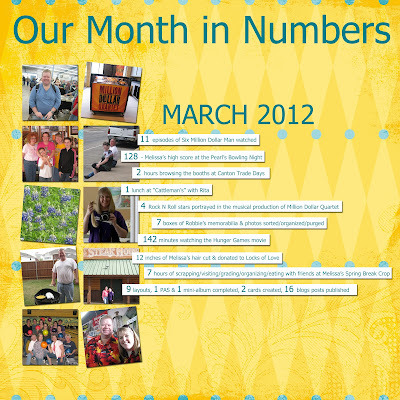 Click here to see the archives and sign up to receive the newsletter by email. 5. Cheryl McCain of Scrap Your Life is hosting a free class to encourage moms to create an album about themselves before having children. Click here for the introduction to My Life Before I Was Your Mother. 6. Alexa of Trimming the Sails often shares digital templates with her blog readers. Click here to download her latest quirky creation. 7. 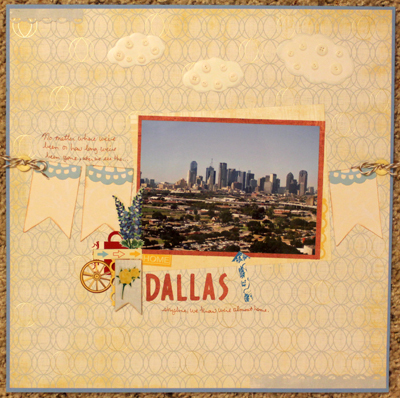 If you're new to digital scrapbooking, check out BPC's free self-paced class Scrapbooking with a Digital Template. This class offers step-by-step instructions for creating a digital layout in Photoshop Elements along with free digital supplies and templates. 10. 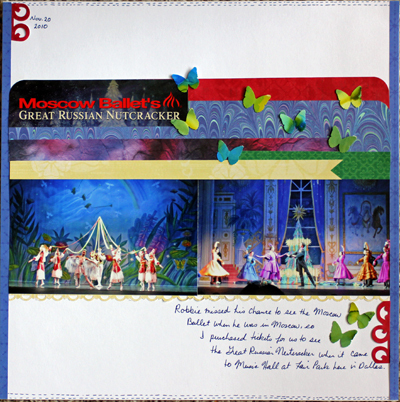 The Masterful Scrapbook Design Sampler gives you access to two lessons and one live webinar each month. Click here to sign up. Thanks for stopping by today! Please let me know if you check out any of this free stuff and be sure to leave me a link to other freebies I may have missed. We are enjoying a nice relaxing Easter Sunday today, just the two of us, feeling blessed & thankful for a Savior who died and rose again. We celebrated yesterday with my parents and several cousins here for a meal and an Easter egg hunt for a cute little 20-month-old cousin. One of the things I enjoy doing when we are having guests over is setting the table, and yesterday was no exception. 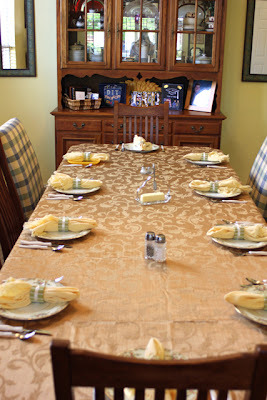 It doesn't matter to me if it's just the two of us or a full table, I always enjoy using our china and pretty dishes and cloth napkins and tablecloths and placements. In fact, I recently created a layout to document this ritual. ﻿I've had several requests for a photo of my hair now that it is 12 inches shorter, so I'll leave you today with a photo of me and my "short" hair. I am so excited to once again be participating in Sian's Storytelling Sunday where each month bloggers link up their stories, told in words or photos. My story today took place a few weeks after the Don't Take My Blessing story I shared in January. every time I did laundry, and since his washing machine couldn’t “talk”, it would have to go! How could he argue with that? 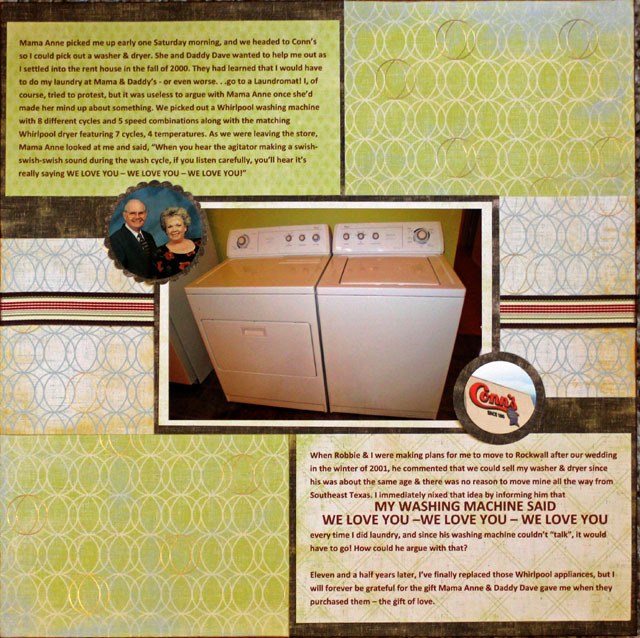 Eleven and a half years later, I’ve finally replaced those Whirlpool appliances, but I will forever be grateful for the gift Mama Anne & Daddy Dave gave me when they purchased them – the gift of love.